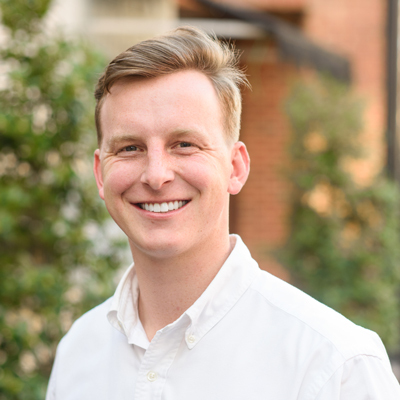 Taft Ledbetter loves looking at the potential in every property, and he is excited to work with clients on such important and fun investments. As a lifelong resident of the Auburn/Opelika area, Taft graduated from Opelika High School and then from Huntingdon College. He grew up in the service industry doing HVAC work with his family’s business, A-1 Air Conditioning. His grandfather started the company as an appliance business and his father expanded with Heating and Air Conditioning about 30 years ago. Taft has always helped with the family business but now focuses on his passion for real estate full time. Taft has been married since May 2015 to Jessica, a Smith Station Junior High history teacher. Her passion for history has influenced Taft, and the pair loves to visit historic districts when they travel and walk up and down the streets imagining it would have been like to live in those towns when the homes were built. Their last adventure was Rome and Florence, and the next one will be Scotland. Taft and Jessica attend Auburn Church of the Highlands. He is in the Army National Guard, 20th SFG FSC, an airborne support unit for the 20th Special Forces Group. He loves being outside, traveling, playing golf, and working on projects around the house.